One of the beauties of a social work degree is that it can help someone land a job in a wide variety of settings. 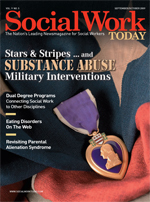 Social workers are employed in organizations ranging from hospitals and schools to grassroots advocacy groups and military bases. But, sometimes, having only a social work degree is not enough to obtain a fulfilling job. Faced with an increasingly competitive job market tightened further by the economic recession, many social workers are looking for ways to differentiate themselves from the rest of the pack to secure the positions they want. And, for some social work students, the way to stand out in the crowd is by completing a dual degree program. These programs allow students to pursue an MSW and a degree in another discipline in parallel, making it possible for students to earn the degrees in less time than it would take to earn them separately. Dual degrees aren’t new in social work, but they are attracting more attention from universities and students adapting to the profession’s increasingly interdisciplinary nature. At least 78 MSW programs nationwide offered one or more dual degree programs last year, according to the Council on Social Work Education (CSWE). The most-offered pairing was an MSW and a law degree (JD). Other popular pairings included MSW/master of public health (MPH) and MSW/master of divinity programs. The CSWE started to survey schools about dual degree programs only three years ago, so it is difficult to identify definitive trends, says Jessica Holmes, MSW, the organization’s associate director of research. But the initial data show growth in the number of schools that offer MSW degrees paired with a law degree, a master of public administration (MPA) degree, or a doctoral degree. Degrees in law, public health, divinity, public administration, and business administration are the most likely ones to be offered as part of social work schools’ dual degree programs. However, many universities also offer more unusual pairings. The University of Michigan has a program that allows its students to earn MSW and master of science in information degrees. The University of Maryland and the University of Southern California give their students the chance to partner an MSW with Jewish studies. And the University of Minnesota offers a program that combines an MSW with a master of urban and regional planning degree. Students who want to earn a dual degree must gain acceptance into both programs offering the degrees. Many schools require their students to alternate their studies between disciplines. For instance, a student who is working toward MSW and JD degrees might study social work for a year, then law for two years, and then return to social work. The number of students enrolled in dual degree programs varies greatly across the country. While some programs may only have a few students at any one time, other programs have dozens. But, no matter the programs’ size, the impetus for creating them often is the same: to give social work students the opportunity to gain other disciplines’ perspectives and the chance to share those perspectives with others who may be unfamiliar with social work. When social work students take classes with students who are studying other disciplines, the mingling of—and sometimes conflict between—those two groups of students’ ideas creates a classroom dynamic that would not occur otherwise. That dynamic gives social work students access to new ways of thinking that they can then use to improve their agencies and communities, says Theresa Barron-McKeagney, PhD, LCSW, director of the School of Social Work at the University of Nebraska at Omaha. The school has provided an MSW/MPA dual degree program since 1999 and hopes to add an MSW/MPH program as soon as next year. Despite the benefits of a dual degree, the programs are not for everyone. In fact, they often come with major obstacles that turn off some students. The primary obstacle is that the investment of time and money needed to complete a dual degree program—though less than that needed to earn two degrees separately—is significantly larger than that needed to get an MSW alone. The logistics of dual degree programs also can be complicated. Course sequences are often rigid, and students must follow those sequences closely or risk not being able to meet their academic requirements. Some students must travel great distances to take all of the classes they need for graduation. For instance, the University of Alabama School of Social Work offers its MSW/MPH program in partnership with the university’s School of Public Health, which is 60 miles away. Then there are the administrative headaches. If one of the academic partners involved in a dual degree program decides to change the curriculum or course requirements of its program, that can complicate the partnership. The same thing can happen if one of the partners has staff or faculty turnover. It also can be a challenge for a social work program to find field opportunities that complement dual degree students’ academic paths. Many social work programs have taken steps to smooth over these administrative rough patches, such as having special liaisons who work with staff at the other school or assigning a dual degree student advisors from both schools. Ironically, although they take classes with two groups of students, many participants may feel isolated. That’s because dual degree students have to switch between different academic programs, thus making it more challenging to build relationships with their cohorts in either program. The isolation can be especially challenging when a dual degree program is small and there are few, if any, other students going through the program, says Shoshi Goldfus, MSW, JD, who completed a dual degree program last year at the University of Pennsylvania in Philadelphia. Is a Dual Degree Worth It? So what happens when dual degree students graduate? Do they catapult over their less-educated peers into higher paying, more prestigious jobs? Or do dual degree graduates find that going through such a program was a waste of time and money? Maerowitz and Goldfus believe that their dual degrees have boosted their careers significantly, despite the aggravations involved with earning them. The research on this matter is less conclusive. Few studies have explored the topic of dual degrees in social work, and the results are mixed. One study (Ruth, Wyatt, Chiasson, Geron, & Bachman, 2006) explored the postgraduate experiences of a group of MSW/MPH program graduates and a group of MSW-only graduates. The researchers found that there were no significant differences in salary between the two groups, and both groups enjoyed high rates of employment. In addition, the vast majority of respondents in both groups reported that they were satisfied with their careers. However, a 2008 study (Miller, Hopkins, & Greif) suggests that a dual degree can speed the advancement of a social worker’s career. Forty-two percent of the 72 dual degree graduates who participated in the study reported that they were hired into management positions for their first job after graduation. The authors also found that the mean salaries of the dual degree graduates ($60,000) were higher than the National Association of Social Workers’ published mean for all social workers ($47,200). Because of the obstacles involved in earning a dual degree, many social work schools offer alternatives that allow students to gain knowledge of other disciplines without having to spend so much time and money. Those schools offer certificate programs, continuing education credits, and electives that provide a closer look at issues that may fall outside the typical social work curriculum, such as gerontology, gender studies, couples therapy, and management and leadership. Miller, S. E., Hopkins, K. M., & Greif, G. L. (2008). Dual degree social work programs: Where are the programs and where are the graduates. Advances in Social Work, 9(1), 29-43. Ruth, B. J., Wyatt, J., Chiasson, E., Geron, S.M., & Bachman, S. (2006). Social work and public health: Comparing graduates from a dual-degree program. Journal of Social Work Education, 42(2), 371-381. The existence of dual degree programs across the country reflects social workers’ desire to partner with their peers in other professions. While such cooperation has long been a part of social work practice, several observers believe it is becoming more common. “Resources are shrinking, and we need to show that the social work profession is on the forefront of working with other disciplines,” says Theresa Barron-McKeagney, PhD, LCSW, director of the School of Social Work at the University of Nebraska at Omaha. One reason for increased interest in interdisciplinary efforts is a greater recognition among social workers that their person-in-environment perspective requires them to reach out to people involved in clients’ work, school, and social lives, says Amber Mollhagen, LMSW, director of recruitment and admissions at the Graduate College of Social Work at the University of Houston. She points to the use of multidisciplinary treatment teams that include social workers and other professionals such as doctors, teachers, and spiritual advisors. Many social workers are also realizing that gaining knowledge in a different subject makes them more effective practitioners at the micro and macro levels, says Rabbi Dennis S. Ross, director of Concerned Clergy for Choice at Family Planning Advocates of New York State. He is an LCSW in Massachusetts and an LMSW in New York. Other professions are reaching out to social workers as well. For example, the School of Public Administration at the University of Nebraska at Omaha jumped at the chance to work with the institution’s social work school to offer a dual MSW/MPA program. Social workers bring an exciting sense of empathy and humanitarianism to management and administration of organizations, according to Ethel Williams, PhD, a professor and the MPA program chair at the university. “It’s definitely a win-win situation for the student and the schools involved,” Williams says. Social work’s connections with other disciplines are only going to become stronger in the future, Barron-McKeagney says. Even disciplines that seem to have nothing to do with social work, such as engineering, have a role to play in meeting people’s needs, she says.